These plates have been specifically designed by Cisbio. 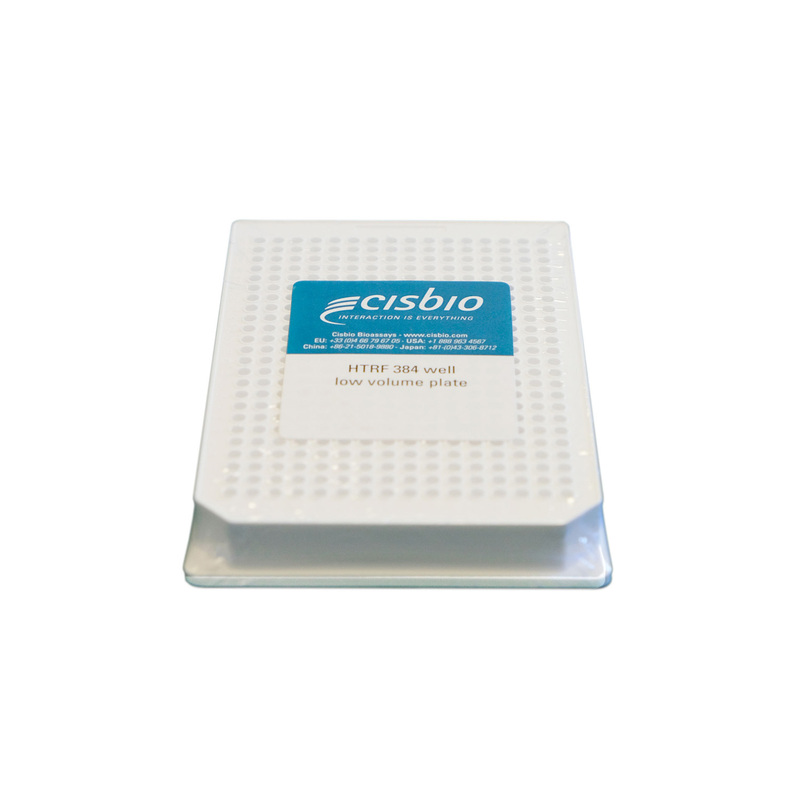 Cisbios 384-well low volume plates can be used with all HTRF assays, for example second messengers, phospho-proteins, cytokines and biomarkers. They can be used in a no-transfer protocol with suspension cells or with a transfer step for adherent cells. These plates can be read on all HTRF certified readers, thus making their implementation in your experiments really easy. Assay reagents were dispensed side-by-side in an HTRF 384-well low volume plate and in a Greiner 384-well low volume plate. As shown below, similar results were obtained, whether the assay was performed in Greiner plates or in HTRF plates. A standard curve was prepared and dispensed in the two different plates: 10 µL of each standard, 5 µL of cAMP-d2 and 5 µL of anti cAMP- cryptate were added into the wells of each plate. HTRF signal was recorded after a 1 hour incubation at RT. A standard curve was prepared and dispensed in the two different plates: 16 µL of each standard and 4 µL of pre-mixed Anti-CCL2 antibodies were added into the wells of each plate. HTRF signal was recorded after an overnight incubation at RT. 16 µL of various amount of untreated NIH3T3 cells lysed with the supplemented lysis buffer #4, were dispensed into the wells of the two different plates, 4 µL of of pre-mixed Anti-SMAD3 antibodies were added into the wells of each plate. HTRF signal was recorded after an overnight incubation at RT.